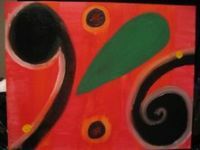 Canvases, acrylic paints and brushes are very important for creating a painting. You don't have to spend a fortune for the materials but I recommend better quality paints, brushes and canvases. Acrylic paints come in a variety of "bodies." Some are flow-type, they come in a bottle and sometimes a tube. Medium to heavy bodied acrylic paints that come in tubes, are thicker and generally cost more. I recommend student quality tube paints for beginners and heavier bodied paints for intermediate and advanced painters. The cheapest paints (often in bottles) are often very thin and the colors are dull. Avoid the bottles! Good student quality acrylic paints in tubes are thicker and the colors is better, but, if you can, purchase one tube of the best quality acrylic paint. You will immediately see and feel the difference! I find that mixing, blending and brushing this kind of thicker acrylic paint makes painting more facile. Again, if you can compare cheaper paint with more expensive, you will see and feel the difference. Also, the colors are better because there is more pigment in the paint. Heavy-bodied acrylics also produce texture and in the long run, you will use less because of their consistency. I usually give the width measurements of brushes to my students because so many brands have different numbers that vary and often, because they are not standardized, students (and me too!) are confused. A 9 x 12" paper palette is easy and convenient. At the end of a painting session the used page of paint can be torn off, folded up and put in the freezer so the paint can be saved and used in the next session (just a minute of thawing will be needed.) The thawed paint can be transferred to a new paper palette page with a palette knife. I find that if the previously frozen colors get mixed on the folded page, but the colors are usually quite interesting and very usable. Buy stretched canvases, not canvas board. Canvases that wrap around the stretcher don't necessarily have to be framed, if you decide to do so with your work. On the other hand, you then have to paint around the sides, and that can be laborious. Canvases that are not wrapped are stapled on the sides and should be framed if you decide to hang your finished work (which I hope you will!) I have found that ordering my art materials from Amazon is easy, affordable and delivery is fast! Packages of canvases ( twos or fours) are cheaper than single canvases and for the most part the quality is quite acceptable for most paintings. Buy packages of these sizes--8 x 10, 9 x 12 and 11 x 14 inches. 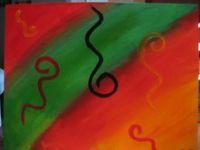 You will want several sizes on hand for the various painting projects in these lessons. Any clean plastic container will do for water plus clean rags or paper towels for cleaning your brushes. Note: clean your brushes well! Acrylic paints are a polymer emulsion--basically you are painting with plastic and that plastic likes to get into the bottom of the bristles of your brushes and become like cement. So clean your brushes well with soap and water and you won't have to buy new brushes all the time. Gather up all of your supplies and begin. And have fun! This basic exercise shows how to make a circle become a sphere. Do this and then draw squares, rectangles and triangles to shade. Note: a circle is shaded with a crescent-shaped shadow, but what kind of shadow does and square or triangle (pyramid-shape) have? Check out Richard Robinson's Painting Lessons. I have chosen to be an affiliate because the quality of his painting instruction is the best--clear, simple and guides you in the right direction. View his special offer. Richard Robinson's Painting Lessons--SPECIAL OFFER. Lois, I enjoyed your newsletter and get a lot out of the visual you tubes. Your help and interest in my work keeps me challenged. Hi, my name is Pam and I just came across your website, surfing for information for wall mural stencils! I was just lucky with this search, I guess. I currently use acrylics to paint figures which I make from Sculpey/Fimo clay, mostly miniatures. But I have also painted with acrylics trying to learn from art books, but I have never painted anything I really liked that much. So I feel I need to start at the beginning and learn from a pro. Since I am now retired I have a lot of time to do this. Thanks a lot for providing this opportunity. Acrylic painting is great. I love the bright colors and building the paint up. The lessons you have where I just put blobs of paint down and mix them are my favorite. I just mix the colors together like you said to see what I can come up with.